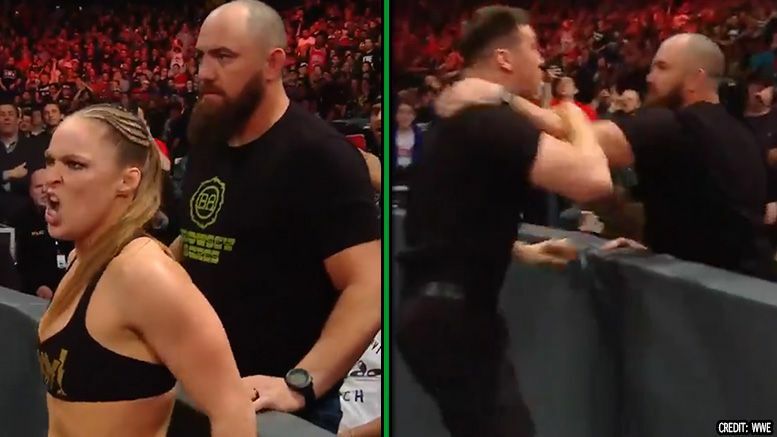 It was only a matter of time before Ronda Rousey’s husband Travis Browne got in on the action, and tonight on Raw it finally happened. Browne was front row on Monday as Rousey defeated Dana Brooke in minutes. The Raw Women’s champ then refused to let go of her armbar submission and referees ran in to get her under control. That didn’t work, however, and she shoved one down. Security guards came out to calm Ronda down while she was approaching her husband, and Rousey went on the attack. When a security guard grabbed her from behind, Browne reached over the barricade and hit him in the face. The couple then left through the crowd. Watch how it all went down below.